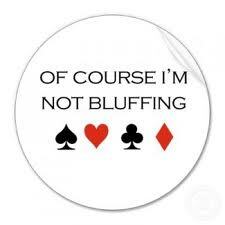 Bluffing is the one weapon a player has that should be used sparingly. Online I think it is used way to often by many players eager to win pots. When bluffing is overused it detracts from your game and ultimately your results and your bankroll will suffer. I have already advocated playing a low percentage of hands in Poker Tournaments therefore establishing a tight table image in the early stages of the tournament. Establishing this image early on in a tournament opens up opportunities to execute poker bluffs in the later stages of the tournament when they are most needed. If you have been folding most of your hands and other good players have noted this then you will be able to play more from the button or cut off seat later in the tournament, coming into the hand with a pre-flop raise. Because of your previous image you have created you will likely get more respect from your opponents that have been paying attention than if you had been playing/raising a lot of pots. This isn’t the only reason that I have told you not to bluff in the early stages of a poker tournament. Often there is so much action going on in the early stages and so many bad players left in the tournament, a bluff in the wrong situation can lead to all sorts of trouble and can be the cause of an early exit more often than not. We were just getting to the middle stages of the tournament. It folds around to the player in the cutoff seat who had been playing a lot of pots. He raises to 3 times the big blind and the player on the dealer button calls. Interestingly the cutoff is the chip leader with 34k and the dealer just has 5k. While watching this my first thought is that the cutoff doesn’t have too much and was just trying to steal the blinds. The flop brings 2s 7h 9h. The cutoff puts in the minimum bet and again I think he’s just trying to buy it with a small continuation bet. The bet is called. The turn is a 4 of hearts. The cutoff bets a small amount again and is called again. The river is the 2 of diamonds. He waits for a moment and then goes all in for the rest of his stack. Now I’m just observing this hand and alarm bells are ringing in my head, the way the cut off has played this hand doesn’t make any sense. If you had the flush or a premium hand why would you not be more aggressive or have made a bigger pre-flop bet? Also he had been playing loose for the majority of the time I had been sitting at the table. It turned out the player on the dealer button had pieced it together just like me and made the call with a pretty weak but winning hand. The Bluffing player turned over Qs 8c and had nothing. This is a great example of a bad bluff. The player in this situation failed to tell a story. When you do bluff you have to do so in such a way that your opponent will piece it all together and come up with the wrong answer. Just throwing chips into the pot to try and bluff will occasionally work, but eventually will cost you more than you win. I think establishing a tight table image is most important when thinking of trying to bluff. You will command more respect when raising pre-flop or betting post flop. Bluffing is a weapon that should come into play more as the tournament goes on. Why? Because you’ve had time to establish a tight table image and you have also had time to size up other players. You get to know better who your bluffs will more likely work on. When your bluffing your always trying to sell your opponent(s) on the story you are trying to tell. Knowing your opponents and knowing that they think you have a tight table image will massively increase your chances of making the sale.